This guide was created to support students in LW 466 with their major research project. How do I get to/access Lexis Advanced? Visit www.lexisadvance.com. You should have received an introductory email with your ID and a temporary password. Login and make sure you change your password to something you'll remember. If you did not get an email with login information, please contact us at refdesk@clarkson.edu. 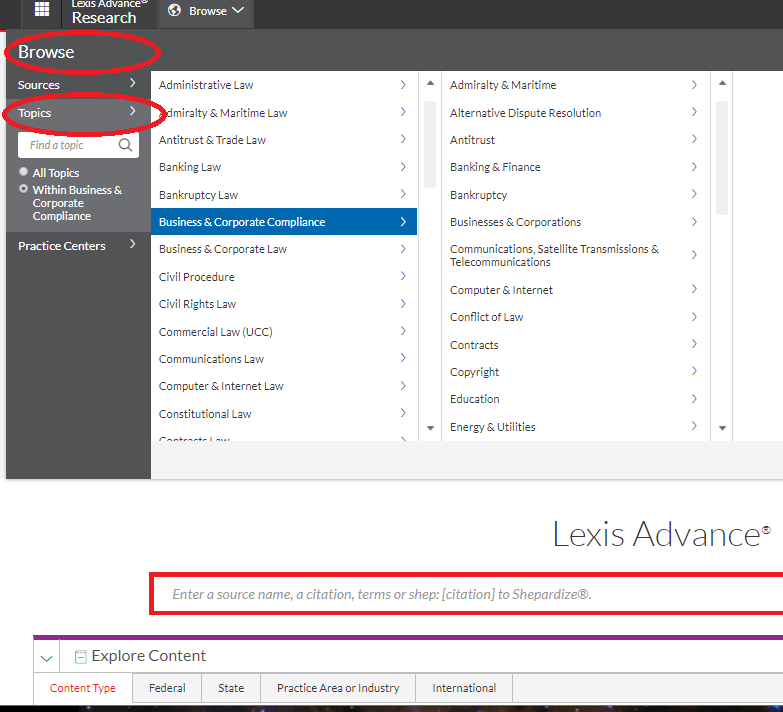 This is the homepage for Lexis Advance. You can do an advance search by clicking "Advanced Searh" in the blue circle. You can filter what your homepage search is searching by clicking the "Search:" drop down menu in the green circle. You can see the content areas available to you by clicking the tabs in the purple circle. To see more information about what is in a particular collection, click the blue "i" icon, circled in orange above. I have created a custom page with the materials I think you will search the most in this class. Click create a custom page to create your own page with your most searched areas. The favorites tool allows you to see recent searches or set filters, sources or topics as "favorites" for easy repeat searching. The alert tool allows you set up a search to run automatically and notify you of any results. Lexis uses Headnotes to highlight key legal points from a case, using the language of the court. You can think of Headnotes as the main subjects covered by the case. 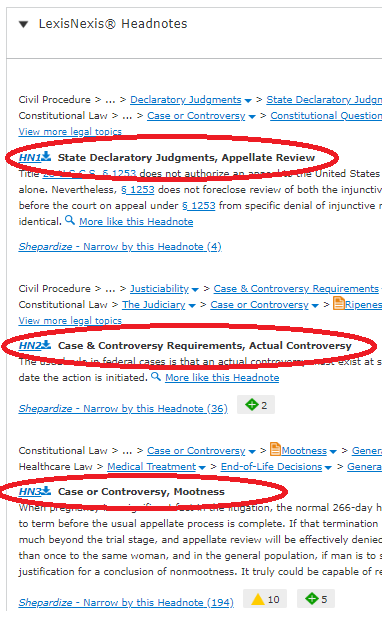 You can use Headnotes to help you find other related cases on similar topics. Look under the Lexis Headnotes section of your case. Each Headnote will be labeled HN# - HN1, HN2 and so on. Cliking on the headnote will take you to the area in your case that deals with this particular topic. What is a Topic Summary? Topic Summaries are a collection of information about a legal topic that is addressed in a case you are viewing, including seminal cases and secondary sources. This is a great place to get started on your research and find several useful sources for your project. To browse a topic, click "browse" and then "topics" in the menu on the lefthand side of the page. You can then drill down to progessivly more specific topics. On the right hand side of your case's page, directly below the Shepard's information, you'll see an "About This Document" box that links to other information about your case. 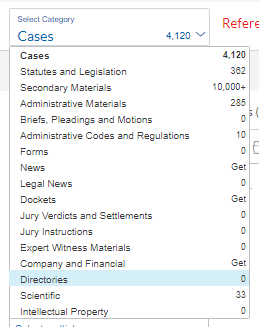 The Legal Issue Trail, circled in order, lists cases that cite to the case you are viewing as well as cases your case has cited for a specific legal issue or point of law. 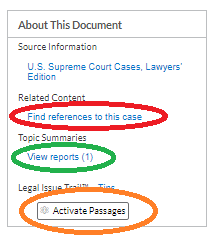 Click Activate Passages, then choose the passage or section of your case dealing with the particular issue you are researching. Find References to this Case, circled in red, will create a list of results referencing your case. You can then filter those results by type of material by clicking "select category" in the upper left hand side of your screen, as shown below. Clicking "view reports," circled in green under Topic Summaries, will show you any Topic Summaries related to your case.